Venice's longtime hostel, the Ostello Venezia, has been renovated, rebranded, and relaunched by one of Europe's trendiest hostel groups. Venice hotel rates can seem expensive, especially for students and other travelers on a budget. Not to worry--the Generator Hostel Venice (formerly the Ostello Venezia or Venice Hostel) offers inexpensive accommodations in a waterfront location that's easy to reach from St. Mark's Square, the Piazzale Roma, or the railroad station by public water bus. ABOVE: The Generator Hostel is housed in a converted granary. The "urban design"-themed hostel can accommodate 240 guests in mixed-gender dorms of 5-8 or 10-16 beds, female dorms of 8 beds, and a small number of private rooms with 2, 3, or 4 beds. Amenities include free Wi-Fi, a lounge, a bar that's open in the evenings, a dining room (dinner only), food vending machines, a 24-hour reception desk and laundry room, a luggage room (where you can store your bags free before check-in or after check-out), and a travel shop. Bed linens are provided. Fluffy towels are supplied in the private rooms; in the dorms, you can rent or buy towels if you haven't brought your own. Dorms also have lockable storage drawers, and you can buy a padlock if you don't have one. Rates don't include breakfast, but the hostel's buffet breakfast (served from 7 a.m. to 10 a.m.) is downright cheap by Venice standards. 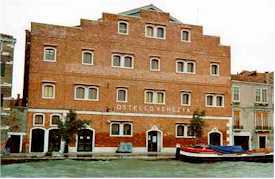 Please note: The Generator Hostel is located on the island of Giudecca, across the water from Venice's historic center, so you'll need to factor in the high cost of transportation when deciding whether to stay there. For other alternatives, see our Venice Hotel Guide. Catch the No. 2 vaporetto in the direction of Tronchetto. This means the boat coming from your left at the railway station or coming from your right at Piazzale Roma. The boat trip will take 15 or 20 minutes. The single-trip fare is horrendously expensive (see our Venice vaporetto fares article), but you can you can get a discount if you've purchased an inexpensive "Rolling Venice" youth card at any Venice tourist office branch or Hellovenezia ticket counter. A 12- to 72-day ACTV Tourist Travel Card (available at any Hellovenezia office or vaporetto ticket booth) is a great value if you plan to use public transportation extensively. The tourist office's Venice Connected pass may be worth considering if you need its services and can figure out the complicated pricing scheme. Note: You'll see a fare listed for baggage at the vaporetto ticket booth. This doesn't apply if you're traveling with a normal-size suitcase or backpack and a carry-on, but you may want to double-check with the ticket agent if you're hauling a steamer trunk or feeling insecure. Our hotel partner, Booking.com, guarantees lowest available rates at the Generator Hostel and other hotels, guesthouses, and B&Bs in Venice. For more pictures of the hostel, go to page 2 of this article.